Construction: The booties’ soles are knit flat, then stitches are picked up and worked seamlessly in the round from the sole to the cuff. 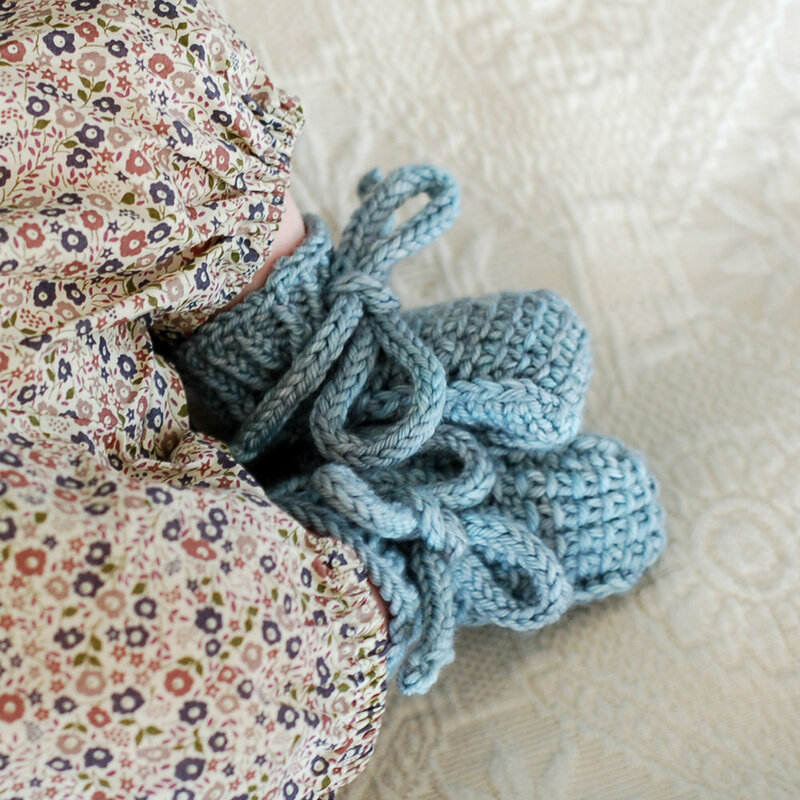 I-cord ties ensure that the booties will stay on the baby’s feet. Skills required: long-tail cast-on, knitting, purling, increasing, decreasing, yarn over, bind off. 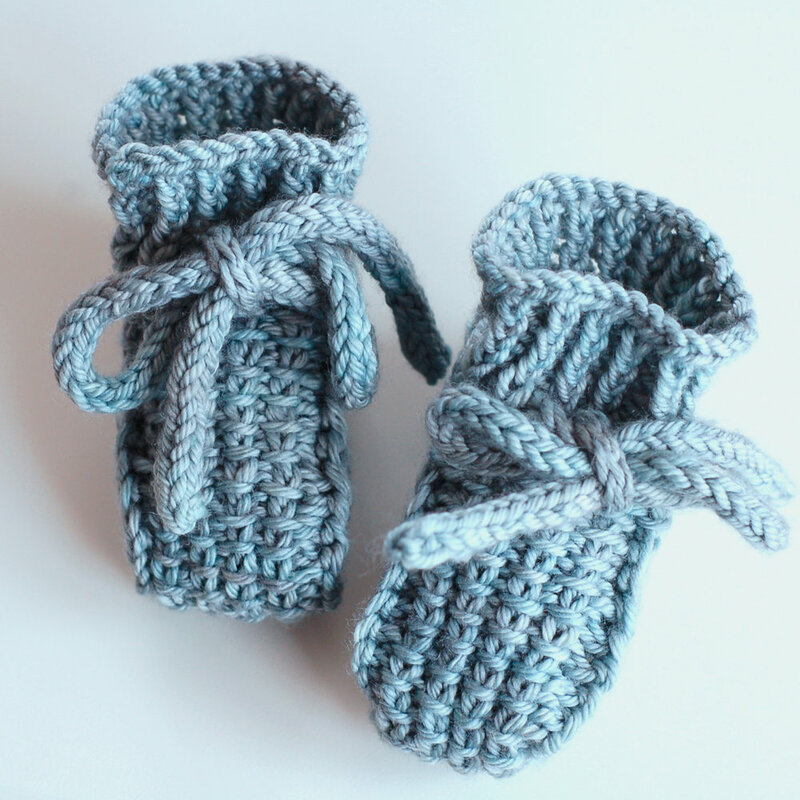 These adorable booties are designed to be gender-neutral and practical (they will say on wriggly little feet! ), and the worsted weight yarn they call for makes them a very quick knit. For corresponding sole length of up to 3.25 (3.75, 4, 4.5, 5, 5.5) inches or 8.5 (9.5, 10, 11.5, 12.5, 14) cm. Approximately 60 (70, 80, 90, 100,120) yards or 55 (64, 73, 82, 91, 110) meters of worsted weight yarn. If doing contrasting ties: ties require approximately 20 yards or 18 meters of contrasting color yarn. Set of US 6 / 4mm double-pointed needles or size needed to match stockinette gauge. Set of US 4 / 3.5 double-pointed needles for I-cord. 20 x 28 rounds = 4 inches or 10 cm in stockinette stitch in the round.